PARLIAMENT – Sing the National Anthem at the start of every sitting of Parliament? Not in the Parliament of Uganda. Legislators on Tuesday rejected a proposal to start every sitting with singing the National Anthem. Parliament’s Rules Privileges and Discipline Committee, which is in course of amending the House’s rules, had said that since parliamentary sittings are an ‘important government functions’, as happens with the Executive’s events, the anthem should be sung. The proposal was informed by a pledge Parliament reportedly made on April 12, 2012. Then, while paying tribute to George Wilberforce Kakoma, the composer of the anthem, Parliament reportedly committed to be opening sittings with the anthem. It is against that background the Committee said that the sittings are important government functions. However, Lwemiyaga Member of Parliament Theodore Ssekikubo argued that singing the anthem does not necessarily make one a patriot. The Deputy Attorney-General, Mwesigwa Rukutana, said if Parliament agrees to sing the National Anthem at every sitting, then they might be required to sing the East African Anthem, too. “That is time-consuming,” Rukutana said. The chairperson of the Rules, Privileges and Discipline Committee, Kenneth Ongalo-Obote, said in Zambia’s National Assembly, legislators sing Zambia’s national song at every sitting. “They play one stanza of the national anthem before every sitting,” Ongalo-Obote said. Budadiri West Member of Parliament Nandala Mafabi said it might be that Zambia’s National Assembly does not have much business, and, therefore, sings the anthem to while the hours away. 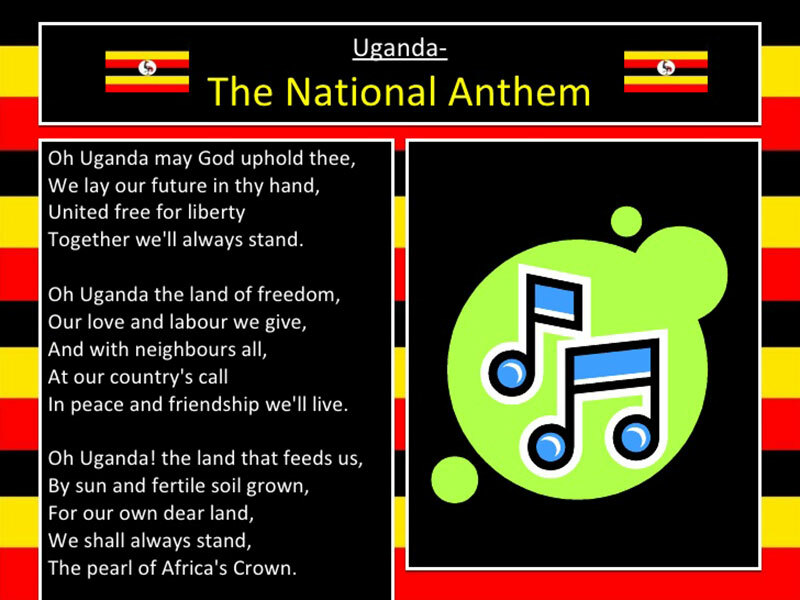 In April 2012, the Daily Monitor newspaper reported that President Museveni, through the then Second Deputy Prime Minister Henry Muganwa Kajura, had directed that during national functions, the congregants should sing the three stanzas of the National Anthem. Before his directive, they would sing one. The paper reported that Museveni’s directive was meant to “recognise the contribution of Prof. George Wilberforce Kakoma to the nation”. Various commentaries over the years have indicated that most Ugandans cannot sing all the three stanzas of the National Anthem and Parliament’s latest snub will leave many wondering if the legislators are just as bad.